On Monday 2 July, the London 2012 Olympic Torch Relay – presented by Coca-Cola, Lloyds TSB and Samsung – will travel 100.95 miles through 16 communities on its journey from Coventry to Leicester. The Relay will travel through the following communities: Coventry, Rugby, Dunchurch, Northampton, Wellingborough, Isham, Kettering, Geddington, Corby, Dingley, Market Harborough, Lubenham, Foxton, Kibworth Harcourt, Oadby, Leicester. 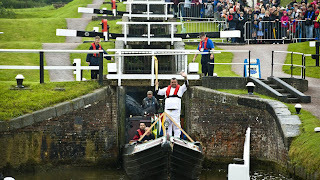 At 07.08 the Flame will visit Coventry Cathedral when the first Torchbearer of the day - Ali Abdillahi - will run through the grounds of the Cathedral. Ali has been nominated by Coventry City Council for his sporting and educational achievements. During the day, the Flame will also visit Althorp House in Northampton and Coventry City Football Club. 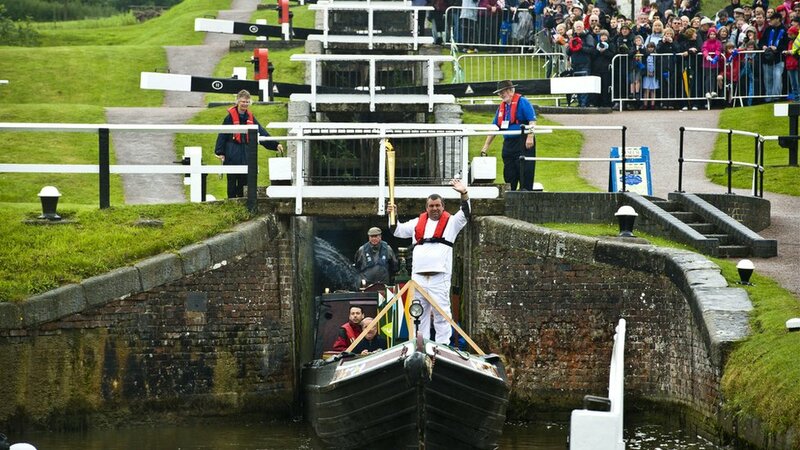 At 16.08 the Flame will be taken on a canal boat at Foxton Locks by David Willson, 48 from Hollowell. David spends his time volunteering and serving others and is hoping to encourage hundreds of families around the London area to host 1000 Olympic and Paralympic Family members in their homes for free during the Olympic and Paralympic Games. These families would not otherwise be able to afford to come to the Games and see their relatives compete. This program has already received the LOCOG Inspire Mark and the goal is to have this program implemented at all future games. The last Torchbearer of the day - Phil Fuller - was nominated by Leicester City Council. Phil is fully committed to changing the lives of other young people in Leicester. He is the elected representative for the Children in Care Council for Leicester. Phil has played a vital role in the setting up of the Children in Care Council, and the development of the Children In Care Council Pledge. This pledge has now gone live across the City. Phil has grown from strength to strength as a representative of young people in the City in particular representing a very vulnerable section of society. The evening celebration will take place in Abbey Park, Leicester. The celebration will feature a variety of entertainment staged by LOCOG and the three Presenting Partners of the London 2012 Olympic Torch Relay - Coca-Cola, Lloyds TSB and Samsung. The line-up includes music from Morning Parade, a dance troupe who will provide a unique fusion of street performance, theatre and sport and dance act Twist and Pulse. The Philharmonia will present a special performance of ‘Bamboozled’, a high energy, audience participation piece featuring Leicester schools accompanied by a specially recorded video performance by the orchestra. Towards the end of the two-hour show, the last Torchbearer of the day – Phil Fuller - will light a celebration cauldron on stage at the event which will enable the Olympic Flame to be seen by the audience. Sunny Hwang, Vice President & Head of Global Sports Marketing, Samsung Electronics, said: "Samsung's Olympic Torch Relay campaign shares the Olympic spirit and encourages everyone to take part in London 2012. Samsung has offered an inspiring opportunity to people around the world to carry the Olympic Flame, as part of our ambition to make London 2012 Everyone's Olympic Games." Timothy Don, 34, who is carrying the Flame in Coventry. Since his 1st place position in the 1998 World JuniorTriathlon Championships, Tim Don has been one of Britain’s most consistently successful athletes. He is the only British athlete that has competed in all three Olympic triathlons since its inclusion in Sydney 2000 (Sydney Athens, and Beijing), but the highlight was winning the 2006 World Title in Lausanne. He also has seven ITU World Cup wins to his name. Paul Davies, 26, who is carrying the Flame in Northampton and is from Northampton. Selected through the Coca-Cola Future Flames programme, Paul's two best friends were tragically shot dead in 2011. To celebrate their name, Paul has established a charity to inspire young people to be a positive force for good in their communities. The charity, Always a Chance, raised over £100,000 within 12 weeks and they hope to raise £1 million within 12 months. The money will be used to support and initiate projects which provide opportunities for young people with the aim of inspiring them to achieve greatness and steer away from the pitfalls of violent crime. Keith Richards, 68, from Rugby and carrying the Flame in Rugby, was nominated through the Lloyds TSB public nomination campaign is a real champion of athletics and has given over 40 years of service to supporting athletics in the Coventry and Warwickshire area. Richard Smith, 26, from Derbyshire and carrying the Flame in Dingley, was nominated through the LOCOG campaign. Tragically half way through Richard’s first year at the top sporting university in Loughborough, his parents and his sister died in a plane crash. To help his grief, he became determined to succeed, dedicating his life to their memory. Having served as AU President he established a sports volunteer programme for students, which was immensely successful. In this role, he led a substantial charity project which involved leading a team of students to raise £15,000 over the academic year for Zambia, which included entering The Steel Man Triathlon. He will visit Zambia over the summer, teaching through workshops different sports and taking part, in talks on AIDs and other health issues. His story is a tragic yet inspiring one. He has been an inspiration to Loughborough students and will certainly raise the profile of sport in Zambia. His parents and sister would surely be so proud. Phil Fuller, 21, from Leicester and carrying the Flame in Leicester. Phil was nominated by Leicester City Council through the LOCOG campaign. Phil has been a member of the YPC for three years now, he is fully committed to changing the lives of other young people in Leicester. He is the elected representative for the Children in Care Council for Leicester. Phil has played a vital role in the setting up of the Children in Care Council, and the development of the Children in Care Council Pledge, this pledge has now gone live across the City. Phil has grown from strength to strength as a representative of young people in the City in particular representing a very vulnerable section of society.